THIS CLEAR COAT SAFE POLISHING COMPOUND QUICKLY ADDS GLOSS AND SHINE TO PAINT SURFACES BY HAND. 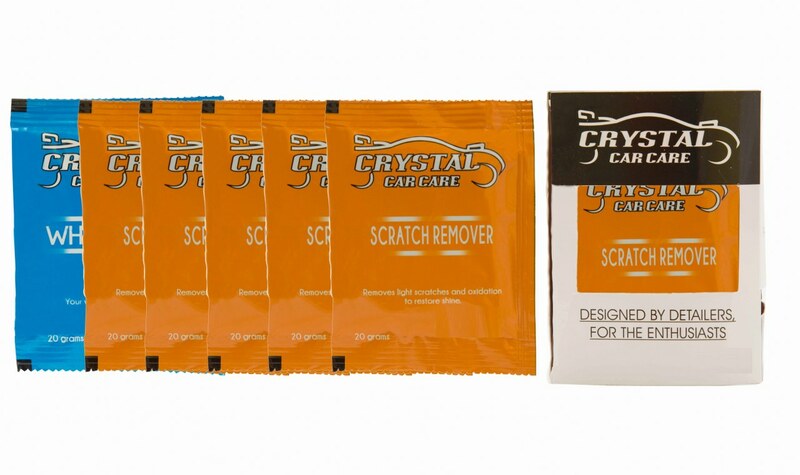 NON-SCRATCHING INGREDIENTS ARE SAFE FOR ALL CAR FINISHES. REMOVES SWIRL MARKS. REMOVES LIGHT SCRATCHES AND OXIDATION TO RESTORE SHINE. APPLY ON A COOL CLEAN SURFACE OUT OF DIRECT SUNLIGHT. APPLY COMPOUND ONTO A DRY COTTON TOWEL, RUB INTO SURFACE USING A BACK AND FORTH MOTION. CAN BE USED WITH POLISHING MACHINE. BUFF LIGHTLY WITH A CLEAN, DRY CLOTH. PRE WASH THE VEHICLE WITH CRYSTALS WASH SHAMPOO AND FOLLOW UP WITH CRYSTALS WAX TO GIVE YOUR VEHICLE THE LOOK IT DESERVES. 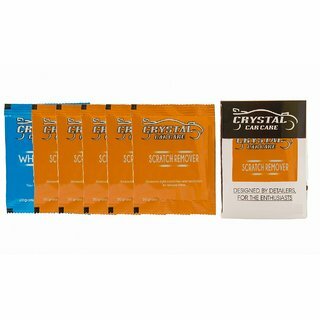 PACK CONTAINS 5 SACHETS OF SCRATCH REMOVER AND 1 SACHET OF WHEELS WAX.